What Does Cellucor Alpha Amino Do? 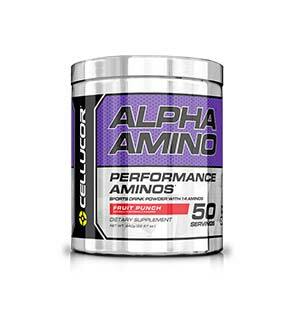 What’s in Cellucor Alpha Amino? Do I Need All of these Ingredients? Far more than a simple BCAA compound, Cellucor Alpha Amino provides a wide range of amino acids and minerals to help keep your muscle cells hydrated and your tissues pumped full of nutrient-rich blood. The BCAA known as L-Leucine is provided in three different forms to help stimulate protein synthesis more effectively, while other amino acids such as L-Citrulline and L-Arginine promote vasodilation to enhance the flow of blood where it is needed most. In addition to this we see the inclusion of Micronized Alanine, and if you’ve ever heard of Beta Alanine then you’ll know that it plays a large role as a lactic acid buffer, helping to increase intra-workout endurance. The answer to this question is somewhat subjective. If you have never lifted weights before or you have only just started training with the past few months then you can probably get by on little more than a simple whey protein powder and maybe some creatine monohydrate. On the other hand, as we become more experienced in the gym the requirement for additional supplements does tend to grow. Branched-chain amino acids or BCAA are one of the most popular and effective bodybuilding supplements on the market, and Alpha Amino goes several steps further by providing you with a whole host of other proven ingredients to help you progress even more. If you are unsure about whether or not you need the ingredients in this product then you might want to consider using a simpler standalone bulk BCAA powder as this will tend to work out a little more cost-effective. Having said that, Cellucor Alpha Amino is a quality supplement that is well worth the money if you are looking for a BCAA supplement which packs a little more punch. L-Leucine is considered to be the most important of the three branched-chain amino acids or BCAA because it plays such an instrumental role in the stimulation of muscle protein synthesis. For this reason it seems like a great idea to include three forms of this essential amino acid. The Alpha-Hydration Formula provides vital minerals such as magnesium and potassium which not only enhance the uptake of fluid into the muscle cells but also stimulate the nervous system to help you generate more explosive force during your workouts. Sodium is of course included, and this mineral plays an equally important role in muscle fullness and hydration levels; perfect for cramps during your high-rep sets. What’s more, the Alpha-Amino Complex includes popular amino acids such as Glutamine, Arginine, Citrulline, and Alanine. Used as a pre-workout supplement or simply to stimulate protein synthesis and enhance recovery between meals, the manufacturer recommends that you mix one scoop of Cellucor Alpha Amino into around 8 – 12 oz of cold water. Note: Speak with your doctor before taking this product and always follow the manufacturer’s instructions on the label. Do not exceed more than four servings per day. Consult your doctor or physician prior to using Cellucor Alpha Amino if you have any pre-existing medical conditions, are pregnant or breastfeeding, or if you are currently using prescription medication. Due to its vasodilatory effects, Cellucor Alpha Amino should be avoided by anyone who has ever suffered a heart attack or other form of cardiovascular disease. 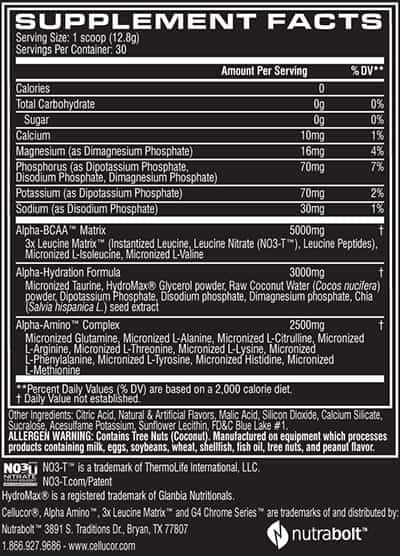 Cellucor Alpha Amino is generally not recommended for individuals under the age of 18. This product is available online in packets containing 30 servings. Cellucor Alpha Amino doesn’t offer much variety in the flavors department but this minor shortfall can easily be overlooked in light of the quality of the active ingredients being served up. If you are serious about your training and really want to take it further in terms of performance, recovery, and overall long-term progress then you will almost definitely want to be using an amino acid formula of some kind, and Alpha Amino is absolutely a superior choice. As we touched on above, the more budget-minded individuals amongst you will probably be better off opting for a cheaper bulk BCAA powder, but if you can stretch your supplement budget just a little bit further then you’ll find it more than worthwhile. It can be hard to find workout supplements that aren’t full of gimmicky unpronounceable and unproven ingredients, but you’re going to be getting the exact opposite with Cellucor Alpha Amino as if offers high levels of quality in heaping quantities.